Is An HD Transition InevitableIt is obvious to even the casual observer that the world of high definition (HD) is upon us. We see it in our homes in ever increasing numbers of HDTV channels. HD has permeated every part of the display and video world, as the dazzling exhibits at the CES show in Las Vegas demonstrate. HD dominates each page in every ad for the big box stores. We are bombarded with the new TV commercials alerting us to the demise of our beloved analog television sets and the need to get our converter boxes by February 2009 if we want to receive off-air broadcasts in the digital world. We even see HD in videoconferencing with companies such as Polycom and LifeSize touting the improvement in the HD experience. Where we do not see much HD (yet) is in the highest growth market in commercial audiovisual, and that, of course, is digital signage. The vast majority of digital signage in public spaces is not HD for a variety of reasons, and the consensus among most folks is that it doesn’t need to be 720 let alone 1080p. The first argument is that the typical screen to viewer distances in digital signage is of a sufficient distance that HD is not needed. There are other constraints to consider such as IP distribution of the content not lending itself easily to HD. Also, most flat panels, if they are running off an embedded PC, don’t have the computer power necessary for HD. There is also the cost of production to consider in HD content. This aside, isn’t it inevitable that all the above will change? In every other area of consumer and commercial video, there is an inexorable move to HD. Isn’t it naïve for us to think that this market will somehow resist that evolution? The bottom line is that there is no black and white answer, so let’s explore the issues to see what might happen. Let’s begin by looking at the difference between DTV and HDTV. The new Digital Television standards mandated by the FCC and developed by the ATSC will be fully deployed by February 2009 and includes digital resolutions from 480 to 720 to 1080. In the SDTV and EDTV formats there are both 4:3 and 16:9 aspect ratios. Stepping up to the new standards to HDTV, we have 720 and 1080 resolutions, both of which are in 16:9 formats. While HDTV is the buzzword and growing rapidly, the vast majority of the video content we see today is in the SDTV and EDTV range and is being broadcast in the 4:3 aspect ratio at 480 lines of resolution. There is no doubt that this balance of content creation is in the process of changing to the HDTV section of the DTV standard as the February 2009 timeline approaches, but we are not there yet and the DTV standard does not mandate HDTV — only the digital transmission of broadcast video. The bottom line is that the cost to convert to the DTV standard is expensive, and going beyond that to HDTV is yet another level of expense. and 1080 with one camp saying 720 is more than good enough and the other camp saying 1080 is the “holy grail” so why not just go there during the process of change. For those who love the “spec war” between 720 and 1080, be aware that tests have shown that the human eye cannot discern the difference between 720 and 1080 resolution on a 50- inch display while sitting on a coach 8 feet from the display. Turning our attention to the display side of digital signage, it is a relatively short story. The majority of plasma and LCD displays, not to mention RPTVs, come only in 16:9 aspect ratios with a few LCD monitors in smaller sizes available in a 16:10 format. They are all digital “ready” at the least and most are HDTV compatible. Consumer displays come with a tuner, which is relevant to the hospitality industry and we will see more and more commercial displays add a tuner as the market expands. All new digital displays employ scaling and processing circuitry that permits the input signal to be scaled to a higher or lower resolution. In addition, many manufacturers are standardizing on 1080p native resolutions in consumer displays, and commercial displays are slowly following suit. The bottom line in displays is that we have a lot to choose from and they can be adapted to nearly any signal configuration we desire. The next step in examining the future of HD in digital signage is to take a look at the transmission backbone. The problem with HD content (source material) is that it is rather large in size. After all, when we deal with digital signage, we are talking megabytes, or gigabytes of data, not traditional broadcasting bandwidth. 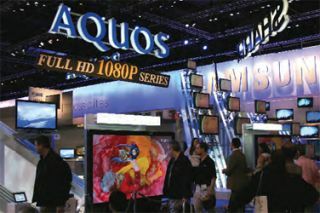 As anyone connected with the IT world will tell you, bandwidth is expensive, and is definitely not available “Manufacturers are standardizing on 1080p native resolutions in consumer displays, and commercial displays are slowly following suit” everywhere and quality of service known as QOS is questionable. QOS is the nightmare of videoconferencing as you can imagine, but also affects digital signage transmission, reliability, and predictability. So the issue with HD content, as previously stated, is size. it can lead to compromised performance for both. And if the sign uses a cellular connection, while a popular choice for allowing ease of install and management, the user can forget about HD content entirely; we just do not have the technology to run HD over a cellular connection due to limited bandwidth. Computing power becomes another significant issue we have to contend with. When we relate computer power to HD, the old adage “more is better” is not exactly true. It should read “more is absolutely required.” Taking a look at how content distribution is handled, all video must be encoded for transport to the signs over the internet. Decoding that video requires the use of software, which, in the case of HD video, requires an advanced PC with a powerful processor and large amounts of RAM memory to provide smooth playback. However, not all digital signage is video; more often than not it is graphics or animations. However this does not allow us to “dodge the bullet.” These kinds of content still require above average PC power. Flash animation, for instance, a popular medium for digital signage content, requires nearly as much power as HD video does. This relates to issues with most “thin client” type players, basically PCs with limited computing power, or embedded PCs, which suffer the same fate. This is rapidly improving, but still requires increased cost. The bottom line is that as PCs evolved, the “floor” of performance is rising, but it will take some time to reach the point where low-cost PCs are effective for dealing with HD content. Enough of the hurdles and to the point. In today’s typical digital signage applications HD is not technically or creatively required. Well-developed SD video looks  DIGITAL SIGNAGE MAGAZINE HD AND DIGITAL SIGNAGE HORIZON DISPLAY - LARGE INFORMATION DISPLAYS Our customer centric business model provides you the most aesthetically pleasing touch screen solution on the market today. Our plug n’ play usability is truly unique. From inquiry to implementation our rapid response can’t be beat. NEC Integrator Select® & Samsung display solutions certified Options: Touch, Protective, and Sunlight Readable up to 100” Contact: 949-595-8244 • Display@horizontechnology.com www.horizondisplay.com DIGITAL SIGNAGE MAGAZINE  great especially at the normally long viewing distances or on smaller screens in kiosks where interactivity is so prevalent. Since a great deal of digital signage material is graphics- and animations-based and we can avoid the often complex and expensive hurdles noted above, does this mean that HD in digital signage is a “no show”? All I can say is not so fast. Large, high-resolution screens at closer viewing distances will speed up the evolution. Interactivity in a “video concierge” type format requiring extra bandwidth for the videoconferencing part of the equation is the next wave of the digital signage phenomenon, and this will add to the mix and lower the bandwidth cost. The number one market for the commercial AV industry is conferencing and collaboration and the number two market is digital signage, so the issues of bandwidth affordability (cost) are in the process of being addressed. We must remind ourselves that we are really in the infancy of digital signage from a technology and cost perspective, and it will take some time to overcome the technical and — more important for the investors — the cost objections, and place at our disposal all the creative, transmission, and playback tools we want. Is HD coming in digital signage? You bet. When will it be here? Best guess is three to five years. Will we see some applications in the near term? Sure for those who want to advertise their leading-edge applications. This topic is better than a soap opera. Stay tuned for the next episode. Alan Brawn (Alan@BrawnConsulting.com) is a principal of Brawn Consulting LLC an audiovisual consulting, educational development, and market intelligence firm with national exposure to major manufacturers and integrators in the industry. He was formerly president of Telanetix and previously national business development and product marketing manager, Pro AV Group, Samsung Electronics. Brawn is an AV industry veteran with experience spanning over two decades, including years managing a commercial AV systems integration company after which he became one of the founding members of Hughes-JVC. He is a recognized author for leading AV industry magazines such as Systems Contractor News, Archi-Tech Magazine, Digital Signage Magazine, Rental & Staging, and The Display Dailey. Brawn is an Imaging Science Foundation Fellow and the managing director of ISF Commercial. Brawn is CTS certified and an adjunct faculty member of InfoComm sitting on their PETC council. He is an NSCA instructor and Learning Unit Provider. He was the recipient of the Pro AV Hall of Fame recognition from rAVe in 2004.